*Includes 13 Extras $1000+ Values! ELS1 Lettering Software, Brother Embroidery Design Card, Monthly iBroidery.com Designs, AllBrands USB Sticks, Creative DRAWings My Editor Sizer Software, 6 Embroidery Thread Cones x 1100 Yards , Exquisite 21 Stabilizer Sample Pack with 48 Minute Solutions DVD, Deluxe Case, Free Format and Thread Color Conversion Software Downloads. Designs in Machine Embroidery Magazine Offer, Embroiderers Compass Guide. *Brother PE770 is a Recommended Best Buy Computer Embroidery Machine in Consumer Digest Magazine! Brother PE770 Embroidery Machine Scoress Consumer Digest Best Buy Awards. AllBrands is a Brother Authorized Dealer and ASC Authorized Service Center for warranty repairs. We also give unlimited tech support by email, fax and phone. Mass merchants do not have tech service or repair departments for your equipment. They are unable to help you directly, only referring any operational, mechanical or electronic questions back to Brother instead of taking care of the problems themselves. Brother and customers should expect that any problems will be taken care of by the dealer who sold you the equipment, not just by referring your requests back to the manufacturer. Optional SA306 Disney Card works in all Brother Embroidery Machines! Let your imagination soar with this wonderfully versatile Brother PE770 Embroidery Machine with USB Stick and Card Ports. Pull patterns straight from the internet, or use 1 of the 136 designs already programmed into the machine. 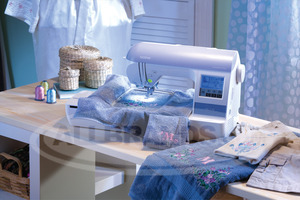 You get all the functions and accessories you need to create elaborate patterns in one, incredibly easy-to-use machine. I have been very satisfied with my dealings with Allbrands. I will definitely recommend you to my friends, Thanks for all your help. Your employee Bilan Brooks was very helpful and just a pleasure to work with. She is what made my experience with Allbrands a good experience. Thank her for me. Thanks again!